Although contemporary kitchen cabinets with a sleek, high-gloss finish look stunning, they tend to highlight smudges and fingerprints. Consequently, keeping the surfaces blemish-free against reflected light is a challenge. However, since cabinets made of solid wood or veneer are usually finished with acrylic or polyurethane lacquer, these surfaces are impervious to most household cleaners, and keeping them spotless is fairly straightforward. On the other hand, if your cabinets are finished with a colored high-gloss lacquered surface, special cleaning techniques are essential. 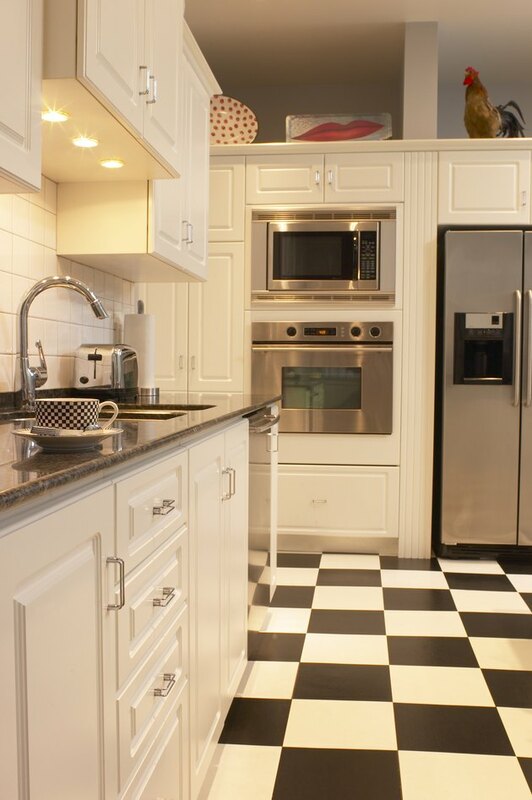 Use special techniques to keep your high-gloss cabinets sparkling. Remove surface dust by brushing your cabinets lightly with an electrostatic dust wand or microfiber dust cloth. Immerse a clean chamois cloth in warm water and wring it out until it is slightly damp. Rub the damp cloth lightly over the surface with a sweeping downward motion; do not scrub or apply excessive pressure. Start on one side of the kitchen and clean two cabinets at a time. Once they are clean, rinse the chamois cloth out under warm running water and wring it out before going on to the next pair of cabinets in the run. Clean off heavy soil and grease marks by adding a tablespoon of mild household cleaner, such as dishwashing detergent, to a plastic bucket half filled with warm water. Use a second chamois leather cloth to wash the cabinet with this solution. Rinse well with clean warm water and finish cleaning by applying the method described in Step 2, using a dedicated chamois cloth kept specially for this purpose.